The Princesa Yaiza Suite Hotel is situated on the beachfront of Dorada Beach, in Playa Blanca and offers stunning vies and sights of the sea and islands, Isla de Lobos and Fuerteventura. The Princesa Yaiza is also very close to the Papagayo Natural Beaches, with weather being nice all year round. All roomy and cosy rooms show views over the swimming pool or the gorgeous gardens all come with a bathroom, bathrobe and slippers and hairdryer, telephone, satellite TV and radio channel, air conditioning, fridge, mini bar (at an extra cost), free internet Wi-Fi connection and a safe box (at no extra cost) and a balcony or terrace. A popular, good quality choice with families and all ages, the Blue Sea Costa Teguise Gardens Apartments offers a delightful combination; an easy-going atmosphere and restful accommodation with super on-site amenities. Situated in Costa Teguise, away from the hustle and bustle, you're far enough away from lively resort centre to enjoy the peaceful ambience, yet close enough if you fancy stepping things up a notch should you want to enjoy days and evenings out. Sun and fun abound here and guests can choose to spend days sunbathing around the swimming pool, indulging in refreshing drinks from the pool bar. That's not all, if you are feeling energetic, you can always challenge someone to a game of tennis down on the tennis or squash court, or head to the sands of Las Cucharas Beach, just a short distance away. The amenities and comforts here will make your stay one to remember! 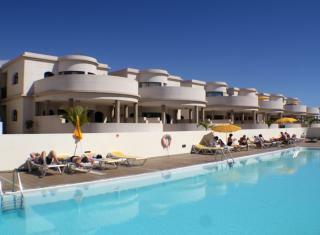 The Hotel Sun Tropical Island Resort is located in Playa Blanca, a quiet fishing village in the municipality of Yaiza in the south of Lanzarote. It was built respecting the environment and the architectural lines of the island, keeping the typical colours and heights. This charming property provides comfortable accommodation for couples and families with 80 one bedroom apartments surrounded by tranquil gardens and a sparking swimming pool. The Parque Tropical Apartments provide an excellent base for those wanting everything close at hand including shops, restaurants, bars and water sports.